It is healthier to shop local. When American researchers studied 3,060 counties, they found lower rates of mortality, obesity and diabetes rates in counties that had a greater proportion of small businesses. Why does shopping local lead to healthier people? Buying locally means bringing home fresher more nutritious food, a more vibrant local economy, driving less and walking more, as well as a healthier environment. Mmm! The best raspberries in the world are those that you picked yourself at your local U-Pick farm. Fresh really does taste best. Why? Fresh produce contains more nutrients. Studies have found that red peppers, tomatoes, apricots, peaches and papayas contain higher amounts of vitamin C when picked ripe from the plant, than when they are picked early and allowed to ripen during shipping. Fresh, local produce that was just picked from the fields and trees are available at your local market, fruit stand or community garden. 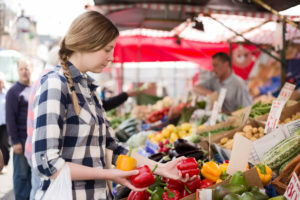 “Farmers markets are the best place to connect with local produce and your local farmers to build those relationships, which are really valuable for strengthening our local food system…across Canada more and more farmers markets are popping up – so there should be one in pretty much every community,” says Emily Jubenvil of The Edible Garden Project in North Vancouver. The Edible Garden Project started when a gap was noted in the access to fresh produce in North Vancouver. They have accessed land to farm on, worked with the community to find space for community gardens, and do educational programs to help people grow their own produce at home. . In 2013, the group shared 5,200 pounds of fresh produce with people in the community who needed it; taught 1500 people about growing their own vegetables; and grew and sold over $32,000 of produce from their farm. In addition, The Edible Garden Project is working to help people learn how to grow their own local, fresh food and have access to it. Annually they grow and donate over 6,000 lbs of fresh produce, which is available to over 1200 vulnerable residents each month. Yes, you can grow your own produce! Even the smallest patio can become a bounty of harvest. Not sure where to start? Visit your local gardening store or community garden. Today the average household drives about 5500 kilometers. In 1970 we drove 2000 kilometers. Sprawling cities and big stores needing big spaces means where we shop tends to be far from our neighborhoods, prompting us to hop into our cars and drive a ways to shop. Why not buy from your local market, community garden or fruit stand this summer? Driving less is a great way to create a healthier environment. According to calculations by the Center for Clean Air Policy in the United States, if proposed changes to vehicle fuel economy and carbon content of fuel occur, we will still fall short of the 60 to 80 percent reduction in emissions needed by mid-century to avoid the worst effects of global warming. Shopping locally and driving less not just great for our environment, it is great for our health. You are more likely to walk to a local market or fruit stand. Walking is great for your health. Walking outside helps manage weight and promotes heart health. It also increases energy, decreases tension, anger and depression, according to a 2011 study in the journal Environmental Science and Technology. It has been recommend that consumers shift their purchases so that 10% of their spending is at local businesses. In Nova Scotia, shifting 10% of purchases to local businesses would mean $1.3 billion would flow back to local farmers and businesses that are neighbors, friends and families. According to a 2013 study by Civic Economics in British Columbia, for every $1,000,000 in sales, independent retail stores generate $450,000 in local economic activity, compared to just $170,000 for chains. Non-profit organizations receive an average 250% more support from smaller business owners than they do from large businesses. Non-profit organizations support our health in many ways including mental health (help lines, support groups) and physical health (sports teams, breakfast and food programs). Grow your own fruits, vegetables and herbs at home. Find a local community garden or market to buy your produce from. Choose locally grown apples: Annapolis Valley (east coast) or Okanagan Valley (west coast). Dine out at restaurants that feature local produce and meats. Sip on wine from a local vineyard, instead of wine from another country. Blanchard, TC et al. “The health and wealth of US counties: how the small business environment impacts alternative measures of development.” Cambridge Journal of Regions, Economy and Society, 2011. Lee, SK, Kader, AA. Preharvest and postharvest factors influencing vitamin C content of horticultural crops. Postharvest Biol Technol. 2000; 20: 207–220. Dumas Y, Dadomo M, Di Lucca G, Grolier P. Review. Effects of environmental factors and agricultural techniques on antioxidant content of tomatoes. J Sci Food Agric. 2003; 83: 369–382.